^ a b c Herrera, Monica (April 23, 2010). “The National: Heads Of State”. Billboard (Prometheus Global Media). http://www.billboard.com/articles/news/958491/the-national-heads-of-state 2014年3月20日閲覧。. ^ a b Maloney, Devon (May 20, 2013). “The National Stop Fighting the 'Dad Rock' Label: 'This Time, We Didn't Care'”. Billboard (Prometheus Global Media). http://www.billboard.com/articles/news/1561451/the-national-stop-fighting-the-dad-rock-label-this-time-we-didnt-care 2014年3月20日閲覧。. ^ "Ultratop − Goud en Platina – 2010". Ultratop & Hung Medien / hitparade.ch. Retrieved March 20, 2014. 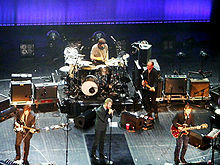 ^ a b "Canadian certifications – The National". Music Canada. Retrieved March 20, 2014.